DUDLEY’S ALUMINIUM has begun work on new student accommodation on the site of Exeter’s former bus and coach station. Study Inn, a complex of student apartments in a former office block in Bristol including curtain walling from JACK ALUMINIUM SYSTEMS in a £1.3m makeover that used a combination of aluminium and PVCu. New from SCHUECO UK is the AWS 75 PD.SI Panorama window, designed for the construction of ribbon windows and as an insert in a Schueco mullion /transom façade system such as the FWS 35 PD. The Quantal aluminium roofing system from ULTRAFRAME has been re-engineered to give it a new contemporary look and boost its thermal performance. So what differentiates a QUALICOAT Applicator? Well, first of all it is not a requirement in the UK to have a Qualicoat licence to supply architectural powder coating. The Door & Hardware Federation has introduced tougher procedures for companies applying to join including an ‘affiliate member’ status for all recruits before being granted full membership and use of the organisation’s logo. CERTASS has launched a Digital Support Package for members to help them go digital, get ratings from their customers and prove their professionalism. The Lock Lock security handle, part of the Sweet range from BRISANT SECURE has won a Good Design Award for 2018 in the Safety and Security category. ALUFOLDDIRECT has been named a triple finalist in Lancashire’s Red Rose Business Awards. Exlabesa Building Systems has appointed Nick Baxendale as National Sales Manager. MILA has expanded its marketing team with the appointment of Laura Chapman as a digital design and marketing executive. EMMEGI (UK) has made several new service appointments as part of a major overhaul of its service and installation department. YALE has launched the Verso, a fully reversible window hinge with what it calls easy close functionality. Roto’s tilt & turn window system, comprising the modular NT face fix hardware and the Designo fully concealed hinge option, has been added to the window and door fittings range from CARL F GROUPCO. Tiger Locks has used ULTION locks to secured 59 doors on an estate in West Yorkshire in nine days after a spate of burglaries in the area. KENRICK has expanded its cylinder range with a new 3 star high-security cylinder. MILA has supported Bridgwater based Notaro Windows in gaining Approved Document Q (ADQ) accreditation for windows to be installed in a new housing development. Incarnation Window Systems is bringing its secondary glazing products to next month’s Homebuilding and Renovating Show at the NEC, Birmingham. EXTRUDASEAL will make its third appearance at the FIT Show, profiling products including gaskets for systems including Smart, ALUK, Metaltech, Senior and Ikon. Senior Architectural Systems has added valuable space to its factories in both South Yorkshire and Wales to ensure that it can continue to satisfy the growing demand for its aluminium doors, windows and curtain walling systems. based aluminium fabricator FUSION WINDOWS AND DOORS has been acquired by the investments division of Key Land Capital for an undisclosed sum. CDW SYSTEMS has extended its range with the addition of the CS 77 flush residential door system from Reynaers. Kawneer was chosen by Barber Casanovas Ruffles Architects as the preferred aluminium curtain walling system supplier for a £15 million building on St John’s Innovation Park in Cambridge. 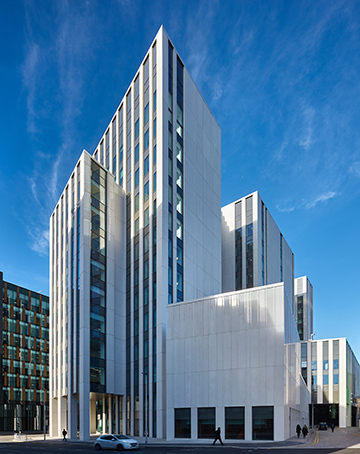 A cap-less fire rated curtain wall system has been completed on a refurbishment development in Manchester in what Aluprof believes is a first for the industry. TECHNAL fenestration systems including MX curtain walling were used in the Business School and Growth Hub’s new flagship building on the University of Gloucestershire’s Oxstalls Campus. The British Fenestration Rating Council (BFRC) has declared its inaugural Fabricators’ Forum a success after delegates from many sectors gathered at the Royal Berkshire Conference Centre, Reading. In 2019, CAB’s 25th Anniversary year, it is totally appropriate that the Association will focus on the metal’s recyclability, one of its outstanding and best known characteristics. However, it sometimes comes across that recycling is some sort of early 21st Century phenomenon and we forget that aluminium has been recycled for so long that 75% of the total production since the 1880’s is still in use. What’s more, recycling aluminium brings no loss in quality and crucially creates an ‘aluminium bank’ for re-use in the future as only 5% of the original energy required for primary extraction is required for re-smelting. The campaign, also described as ‘the first of its kind to hit the UK’s home improvement market’, hits the screens March 5th and will run throughout the rest of the year, backed by extensive social media presence and online programmatic advertising as well as the promise of a TV sponsorship package. GGF Group CEO Kevin Buckley has issued a statement with advice to the industry on what to do in the event of the UK leaving the EU next month without a withdrawal agreement. His advice comes after the organisation’s role in the Construction Leaders Council Forum, and is based on the conclusions reached by the body. Lock supplier Brisant has responded to police warnings and media reports of a ‘terrifying’ new phenomenon of burglars using blowtorches to burn their way through house doors. The government is to issue a new code of practice for flood door and associated products products following media reports of failures among installed flood doors in the wake of the 2015 Cumbria floods. To celebrate the versatility and history of aluminium, fenestration systems manufacturer Senior Architectural Systems is planning to make Wednesday 13th March all about aluminium. Danny Birrel, MSc MCIBSE, technical director of Kawneer, advises how to design curtain wall facades to accommodate building movement.